Style guide	International Day of People with Disability style guide so you can create your own products. 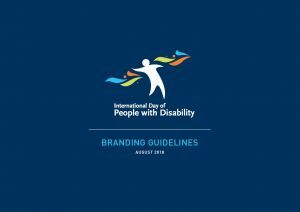 This page is to be used as a guide when using the International Day of People with Disability (IDPwD) logo to design or produce products for IDPwD activities or celebrations. Unless otherwise noted all material presented on this page is provided under a Creative Commons Attribution 3.0 Australia licence. The Department of Social Services (DSS) requests that the use of the IDPwD logo is consistent with the aims and messages of IDPwD and that it helps raise awareness of IDPwD. In October 1992 the United Nations General Assembly passed a resolution declaring that 3 December each year will be the International Day of Disabled Persons. The event was renamed International Day of People with Disability (IDPwD) in 1997 by Australian community representatives to place a greater emphasis on the abilities and achievements of people living with disability. Individuals and organisations throughout the country are being encouraged to celebrate the day. IDPwD is unique among community awareness days, as it unites disability organisations, businesses, federal, state and local governments and the community. The day is a collaborative effort to celebrate and acknowledge the experience and expertise of people with disability. IDPwD is an opportunity to: celebrate the contributions people with disability make every day to their communities; make a positive contribution to the lives of 4 million of Australians with disability. All organisations using the International Day of People with Disability branding are requested to consider accessibility for their audience. Below are several considerations of accessible design that are recommended for promotion of International Day of People with Disability. There must be enough contrast between foreground and background colours. The dark blue text against a white background and white text on a dark blue background are the most accessible. ensure all correct style/heading structure is used when developing a document. use the phrase ‘people without disability’ rather than ‘able-bodied people’ or ‘normal people’, as the suggested phrase promotes inclusion.